My new data analysis tool has been helping produce science results! I recently blogged about writing the MethylCal program to aid the analysis of experiments in epigenetics, where studies are designed to shed light on the various intrinsic or environmental factors that may enhance or impede the expression of different genes. The level of gene expression can be traced via the concentration of DNA methylation in a sample. MethylCal determines the calibration solution between several observed properties and the concentration of methylated DNA in standard laboratory samples, and then applies this calibration to the experimental DNA samples. Examining the varying methylation concentrations of experimental samples exposed to different conditions therefore allows us to determine the important factors affecting gene expression. Skeletal muscle tissue that has once been inflamed will thenceforth show less and less growth with each subsequent inflammatory episode, basically leading to muscle wasting. 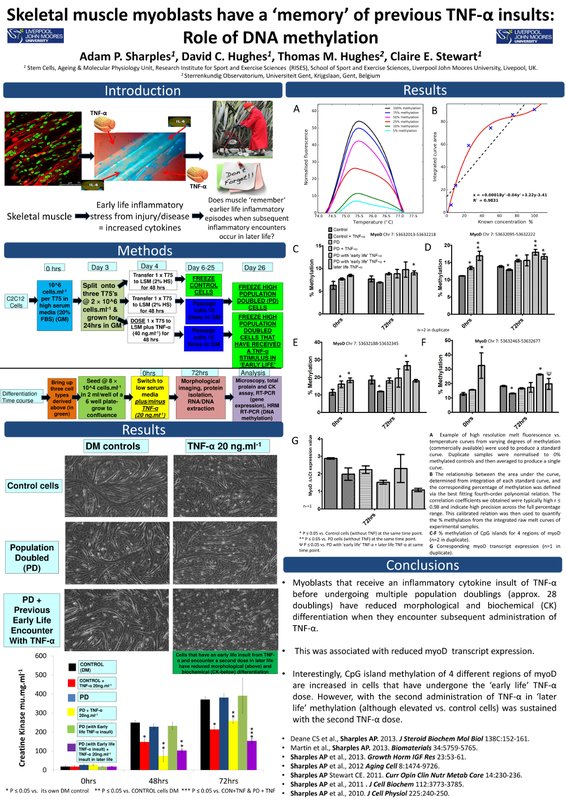 This poster of their results was presented by Dr. Sharples at the EMBO workshop on Molecular Mechanisms of Muscle Growth and Wasting in Health and Diseases, held this month in Ascona, Switzerland. I’m proud to say that the other Hughes in this work is in fact my brother, now in his final year of doctoral research. The next step in their work is to repeat the experiments using different markers of muscle differentiation. A comparison of all the different available markers would be very interesting for verifying their conclusions. To better read the poster, grab a copy of the pdf by clicking the image.